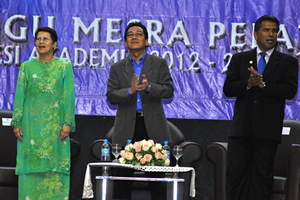 BANGI, 4 Sept 2012 – Students entering institutions of higher learning have been reminded that success will only come from hard work and not through shortcuts as what is gained easily can also be lost in the blink of an eye. 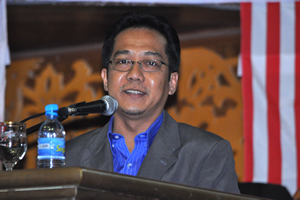 Deputy Minister of Youth and Sports, Dato’ Razali Hj Ibrahim speaking to over 2000 new undergraduates of The National University of Malaysia (UKM) here today advised them to concentrate on achieving excellence in their studies instead of allowing themselves be used by unscrupulous politicians. Addressing the students at a ‘meet the nation’s leaders’ programme as part of their orientation week, he urged them not to be easily manipulated by unquestioningly accepting claims by certain politicians as gospel truth. They should instead use their intellect to question the veracity of the claims. They should also investigate and look for their own answers and not accept the claims blindly because they are intelligent enough to make an objective assessment. In searching for their own answers they should keep in mind the source of information that they use as reference. The source must be reliable enough to be accepted as an independent information giver with no hidden agenda. Dato’ Razali said they should make their own decisions when it comes to politics and should not also be easily swayed by sentiments, as this can lead to conflicts and jeopardise the stability of the country. Conflicts in a nation, he said, can be brought about by differences in any one of the three factors: religious beliefs, ethnicity and territory. But in Malaysia all the three elements are present and religious differences and ethnic tension can easily erupt if the people’s sentiments are manipulated, Dato’ Razali said. Vice Chancellor, Professor Tan Sri Dato’ Wira Dr Sharifah Hapsah Syed Hasan Shahabudin, Deans of Faculties and lecturers also attended the gathering.